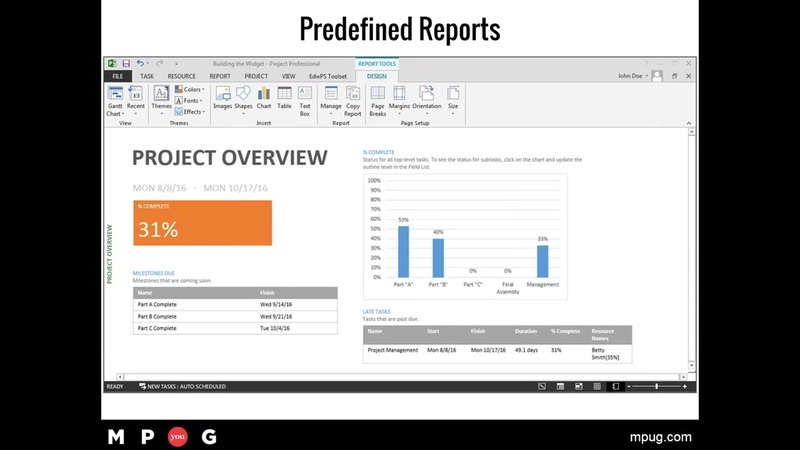 Microsoft Project offers a wide range of tools for creating reports and dashboards to communicate the status of your project. But how do you decide what data points should be included, and how they should be displayed? In this session you will learn best practices for creating dashboards that go beyond just delivering information, to communicating your project data in a way that will engage your stakeholders and move them to action. Learn not only the how, but the who, what, when, where, and why of creating, populating, and delivering dashboards. Jeff Beverage is an experienced project manager, speaker, and educator of over 10 years. Jeff represents Edwards Performance Solutions, developing and facilitating training in Microsoft Project, Project Server, and SharePoint, as well as in topics related to project management fundamentals and leadership. Previously, Jeff supported government and commercial clients as a project management consultant for Booz Allen Hamilton, and Veterans Enterprise Technology Solutions. Jeff is ITIL v3 Foundations certified, and holds certifications as a Project Management Professional (PMP) and Certified Scrum Master (CSM). Jeff holds an MA from Mount Saint Mary’s University, and a BA from the University of Maryland. This video is very informative and helps users to optimize their dashboards for better communication.